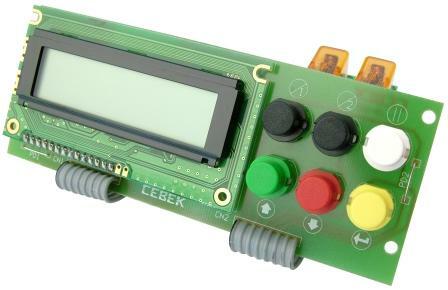 Cebek I-210 is a 2 output programmable sequential controller. Each output will be able to control a program of up to 120 steps. Steps can be configured in three states: “connected output”, “disconnected output” and “output according to input level”. The step time will be adjustable between 0.5 second and 100 minutes. With the eight switches and LCD module you can select the required operating mode for the required output. It will maintain in memory stored programs even when the power supply fails. It has LED's to indicate the relays condition.